This is a summmary of Dad's WWII experience. I have compiled this from his personal writings and information he told to me. The overseas portion is from a diary he kept from April 1943-August 1943. For unknown reasons he stops writing in the diary in early September. 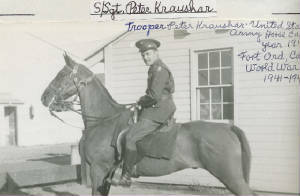 Prior to his overseas service in WWII, Dad was in the Ohio National Guard 107th Horse Cavalry enlisting in November 1940. On March 5th, 1941 his unit was inducted into Federal Service as the "Winds of War" were blowing.. Between then and December 1941 he participated in military manuevers in the Carolinas and Louisiana and training at Camp Forrest TN which is where he was when Pearl Harbor occured. "On December 6th 1941 my two buddies and I rented a hotel room for the weekend in Nashville TN as the 107th Cavalry was invited to a big Dance at Vanderbilt University. It was a great dance and those Vanderbilt ladies really knew how to party! Late in the weekend there was a commotion and a pounding on our door. When we opened it the MP's came busting through stating that all military personel had to return to their posts, this is an emergency! So our women scurried around getting dressed and we three did the same except that our spurs had been hidden by our women. Which much swearing and threatening they gave us our spurs back which of course are essential to a horse soilder. We learned that Pearl had been bombed so we got on the next bus back to Camp Forrest." Thurs-April 29th-Entrained at Ft. Lewis at 1500 heading east, destination unknown. Train took us across the northern US. I learned that there would be a stop in my hometown of Cincinnati with a one hour layover there. So I called my Mom and Dad to tell them. Lots of gambling on the train and crowded. (May 4th) Arrived in Cincinnati and Mom, Dad and brother frank met me at the station. We had an hour and we made the most of it. Frank is home on military leave. Great to see them and hug them again. Brothers Bob and Carl are also in the military and we all hope it's a short war and we all come home safe. The signal came to leave. Mom was crying, Dad was all choked up, knowing the perils of war are uncertain and unpredictible. As the train left I was on the rear platform of the train waving and wondering if I would ever see my dear family again. The next day we detrained at Newport News VA and we stayed in barracks for several days. There were alot of WACs there and we tried to make dates with them but they are aloof and hard to come by. I will say they are NO American beauties by any means. (May 23rd) Docked at our destination-Port of Oran, Algiers, North Africa. Glad to be back on solid ground. Its a very picturesque town. Men dressed in robes, markets, and soilders in all different types of uniforms from all different countries. Natives poor and ragad looking. Lots of whore houses. The women are dirty looking. The Americans are always overcharged too. Lots of wine and many vineyards here. The water has a fowl taste. After a few days all the men had diarea and the female nurses all sick too. Lots of severe dust storms here. After a week or so we finally adjusted. Church services, movies, and we organized a good baseball team. We're allowed one quart of water per day. Sometimes we go to market. People all yelling, fruit isn't very good and flies all over the meat. (July 5th) After almost 2 months in this hell hole we finally move out, loading everything on trucks then transfer to train. We only have K rations and stop at every water hole. Train moves slowly. Finall reach our destination Bizerte. We notice some nomadic Arabs with there pitched tents and herds of camels. Lots of German POW's here. I speak with them and they are happy that there is someone here that can speak their language. For them they are happy the war is over and they are prisoners. I was hoping that by some small chance I would meet my two cousins, Geza and Franz who are in the German army. I stayed with them in Hatzfeld Romania in 1938. We learned Sicily has been invaded by US Forces. We're short of rations and live of the land. Lots of damaged and bombed vehicles from the front here. We also see alot of military cemeteries. Biggest problem is short on water and the intense heat and Malaria. Everone trading everything incl cigarettes. Railroads are all crowded. We still keep the baseball practice up though. (Aug 5th) We had our first air raid sirens today which turned out to be false. Went through an immense miltary salvage yard with all kinds of Axis destroyed tanks,trucks,weapons,etc. (Aug 16th) I have to attend a rest camp on the Mediterranian coast for 2 days. Nothing to do but swim and sleep. Our camp is in an immense olive grove. A mile away the Axis previously evacuated leaving tons of equipment. There are two sunken ships off shore. The Axis sure caught hell here. Tonight we were swiming with a full moon, very peacful. After the swim Bizerte was hit with Nazi air raid and we all had a ring side seat watching the whole show in the skies over Bizerte-and a big air raid it is. The sky was completely lit up with anti-aircraft fire,tracer bullets and many searchlights. When the bombs hit they let out immense flashes of penetrating fire so loud it could burst your eardrums. I later learned the bombs caused alot of damage, death and destruction. The raid lasted over an hour and one Luftwaffe plane flew very low directly over our heads heading out toward sea. The head and shoulders of the pilot in his cockpit is a perfect silhoutte against a low full moon and a dramatic picture book scene. I hope he returned home safe. Afterwards, we returned to our bunks and discussed the raid. After returning to our camp the next dnight we experienced an air raid there. (Aug 23rd) Had my first slug of whiskey since leaving the states and it was damn good too. Got it from a nurse friend of mine who chinled it from a Major. Gave Chico a slug too. Prosit! Alot of the nurses sneak off at night with the officers to the olive groves for hanky panky, which doesn't set well with us guys. The next day my nurse friend got me another bottle of booze which I will stash before Chico sees it. He has a good smeller. After snooping around I also found alot of letters written home by German soilders. They mostly wrote about family and friends and all wishing the war was over. (Sept 3rd) Good ball game today. We won. Good News! We learned Patton and US Forces invaded the Italian mainland. My nurse friend wants me to see her after duty hours. No deal. Too dangerous!